Looking for something different and fun? Let us do all the work!. 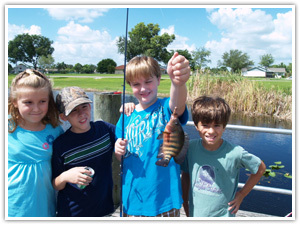 Most fishing parties are usually set up in your backyard or a local park depending on water access. Birthdays and religious parties are most common but whatever the occasion is we can help celebrate it. The party includes fishing, fun games and prizes. We can only set up a few parties per weekend, so please call or e-mail early to make a deposit and reserve a spot. 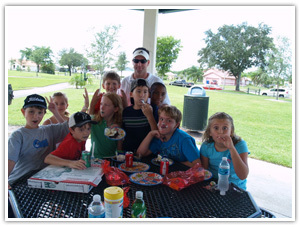 - We are flexible and can add or make changes to accommodate you and your family on your desired party package. The Airport Hilton has great facilities with a dock for fishing and restrooms. They also have food including pizza. Hilton is a popular spot for fishing parties. Call or e-mail for more details or to make a reservation! New Peacock Bass Frenzy Charter! Great for Birthdays!